I made some cold-pressed soap last night. It won’t be ready to sell at the Dallas GA Farmer’s Market on my first day of the selling season but I will have enough melt-and-pour soap and candles for opening day. I hope this first batch of cold-pressed soap using a new recipe comes out okay. I should be able to unmold it tonight and cut it as long as it has firmed up. My husband built for me a new soaping table so I could have plenty of room to spread out for my soaping activities. 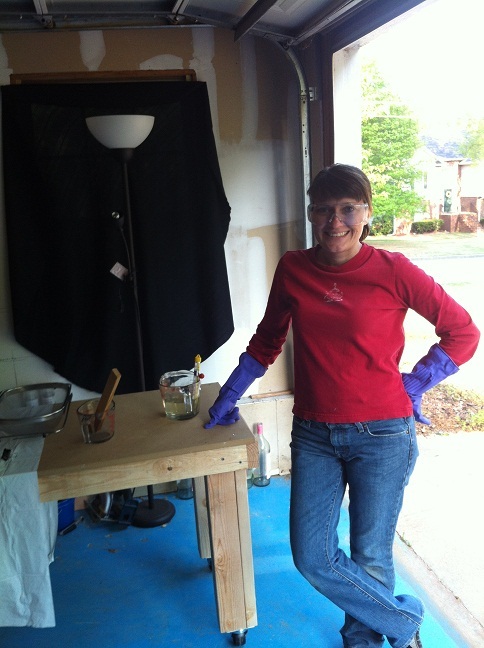 There are also some pictures of the soap process from last night also. This is the lye and water mixture cooking. Coconut oil, olive oil and castor oil mix before the lye was added. These are the molds that I used. 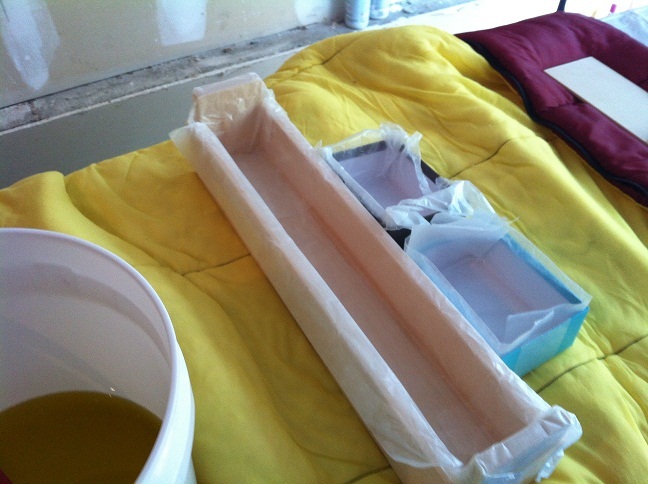 We only used the wooden mold (the long one) but I am always prepared in case I make too much soap for the mold. I’ll post some pics once I unmold it and cut the soap. This entry was posted in Making Soap is Fun and tagged castor oil, coconut oil, cold pressed soap, cut soap, dallas ga, lye, lye soap, olive oil, soap, soap making, soap mold, twitter. 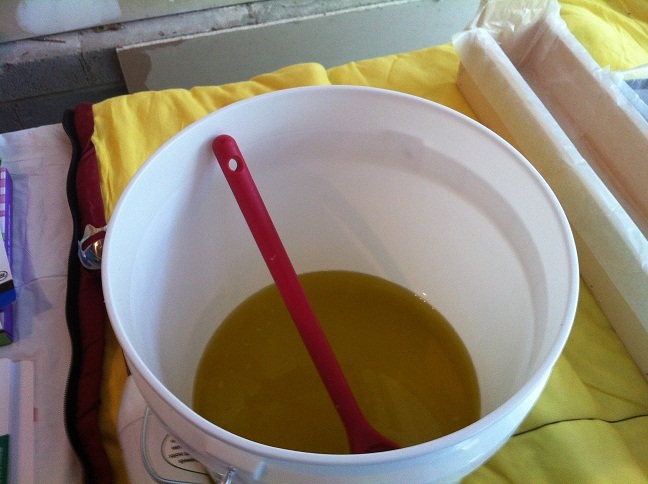 Learn to Make Olive Oil (Castile) Soap in 6 Minutes. 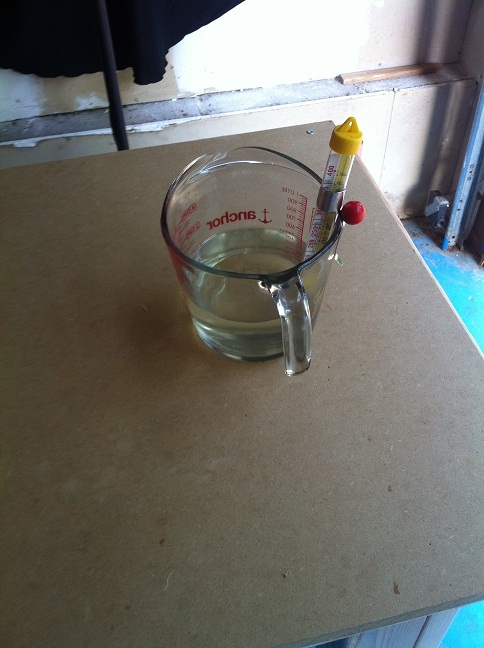 This entry was posted in Uncategorized and tagged castile soap, soap making. Twisty Stitches Cold Pressed Soap Store Now Open!!! Anyone seen Bob the Builder or Handy Manny or Fix It Felix Jr? "If you are new to soap making please do not attempt this process when children or pets are about as lye is highly caustic. When lye is mixed with water it heats up. If it comes into contact with your skin or eyes, rinse immediately with cool water. If you spill it on any surface, wash it immediately or it will corrode. Keep a jug of vinegar nearby to help neutralize any spills. When mixing the lye and water together, keep your face away from the container and ensure you are working in a well-ventilated area. Use safety equipment such as latex gloves, safety glasses, an apron and a mask when handling lye at least until you are experienced at which point you can make an informed decision for yourself. Once the lye solution and oils have been mixed together and saponified, the solution is neutralized and no longer caustic."